I'll be posting more about this later, but I'm taking a long weekend in San Francisco in mid-May. Obviously I'm just thrilled to be getting away, but I'm also excited because due to the excellent Spring shopping I've done lately, I feel like packing will be a breeze. Unlike before most trips I've taken lately (Vegas; Arizona), I don't feel an overwhelming desire to buy a bunch of new clothes to wear. Instead, I'm just thinking of the great combinations I can make with the pieces I already have. Now, I said there was no overwhelming desire. There's still a little tiny pearl of desire in there. 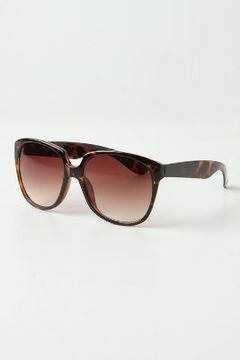 And I came up with a great little fix for that tiniest of desires: these stylish shades from Anthropologie. The shape is oversized and retro - my favorite combination, and they come in a sort of cloudy grey blue as well as a muted redish pink. Also, they're just $24, so it won't be the end of the world if they fly off my head while I'm hanging off the side of a trolley.